The gesture raises hopes that Washington and Havana could be on the verge of a breakthrough, but the White House says the encounter was simply an exchange of greetings as the U.S. leader made his way to the podium to speak. JOHANNESBURG — President Barack Obama shook hands with Cuban President Raul Castro Tuesday at a memorial service for Nelson Mandela, a simple gesture that signaled possible thawing between the leaders of two Cold War foes. The brief encounter between the U.S. and Cuban president came during a ceremony that celebrated the former South African president’s legacy of reconciliation. Obama was greeting a line of world leaders attending the memorial in Johannesburg before delivering his own eulogy in which he urged a new generation to embrace Mandela’s life work as their own. 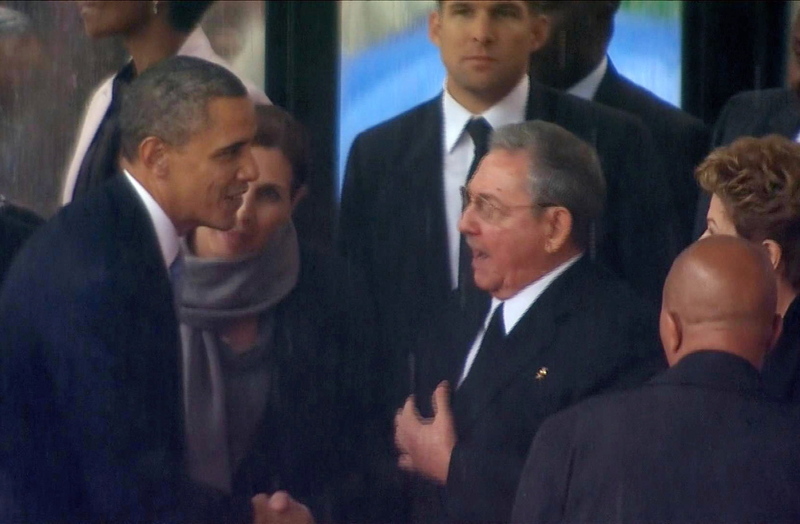 Obama adviser Ben Rhodes said the handshakes with Castro and other world leaders weren’t planned in advance and didn’t involve any substantive discussion, but were simply an exchange of greetings as the U.S. leader made his way to the podium to speak. “The president didn’t see this as a venue to do business,” Rhodes told reporters traveling aboard Air Force One back to Washington. Still, more than half a century after the U.S. cut off diplomatic relations with Cuba, such exchanges between American and Cuban leaders are exceedingly rare. U.S. officials often have gone to great lengths to avoid having presidents meet Cuban leaders, even in passing. In fact, when former Cuban President Fidel Castro, who led the nation for nearly half a century, shook hands with former President Bill Clinton at a U.N. Millennium Summit luncheon in 2000, he said Clinton had been the first U.S. president to do so. Despite Tuesday’s handshake, Obama still offered an implicit criticism of governments like Cuba’s when moments later, he said that too many people embrace Mandela’s legacy of racial reconciliation but passionately resist economic and other reforms. “There are too many who claim solidarity with Madiba’s struggle for freedom but do not tolerate dissent from their own people,” Obama said, referring to Mandela by his clan name. Making his way to the podium for his speech, Obama also greeted Brazilian President Dilma Rousseff with a kiss on the cheek. Rousseff and Obama have clashed over reports the National Security Agency monitored her communications, leading the Brazilian leader to shelve a state trip to the U.S. earlier this year in a show of anger. In another potentially uneasy exchange, Obama also briefly greeted Afghan President Hamid Karzai, whose refusal to sign a security agreement with the U.S. before year’s end has irritated the Obama administration. The U.S. and Cuba have recently taken small steps toward political reconciliation, raising hopes that Washington and Havana could be on the verge of a breakthrough. But skeptics caution the two countries have shown subtle signs of thaw in the past, only to fall back into old recriminations. At a fundraiser in Miami last month, Obama argued for a renewed approach toward Cuba. “We’ve started to see changes on the island,” he said on Nov. 8. In 2009, Obama made waves when he shook hands with the late Venezuelan president Hugo Chavez, a strident critic of the United States, at the Summit of the Americas.